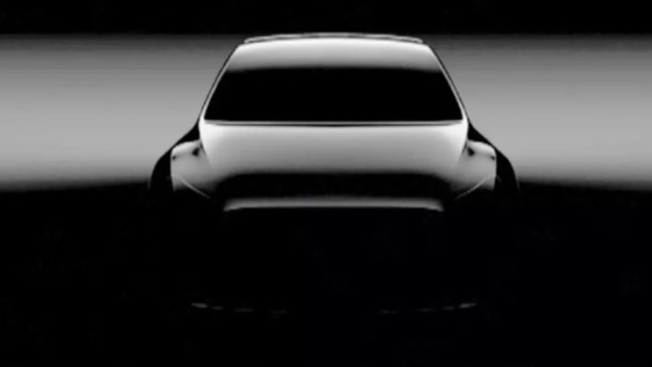 Tesla teases the Model Y.
CEO Elon Musk has talked about releasing a crossover for years, but he’s kept the electric car maker tightly focused on ramping up production and distribution of its popular Model 3 premium sedan for the mass market. The Model 3 is Tesla’s first foray into vehicles priced well below the company’s high-end Model S sedan, with a base price of $69,250, and Model X SUV, which starts at around $78,450. The Model Y, which will be unveiled at 11 p.m. EDT, is expected to be a more affordable alternative to its Model X and the company’s first entrance into the hot cross over market. The crossover is expected to be about 10 percent bigger than the Model 3, cost about 10 percent more, and will have slightly less range with the same size battery, Musk said in a March 3 tweet. Many investors and industry analysts say Palo Alto-based Tesla cannot enter the segment soon enough. Why legendary investor Ron Baron is betting big on Tesla from CNBC. Investors worry that increased competition in the electric car market is reducing demand for Tesla’s sedans and sports cars, including the Model 3, which Tesla only recently began selling at its long-promised price of $35,000. To make the Model 3 that cheap, Musk told investors last month that it had to close the majority of its showrooms and shift most sales online. The automaker has since walked those plans back, but appears to still be cutting costs. This has furthered speculation that Tesla is struggling to profitably sell the Model 3 at lower prices. Crossovers, which generally combine a roomier SUV body on top of a sedan frame, are one of the fastest growing segments in the automotive industry. Customers increasingly want taller vehicles that are easier to get in and out of and offer flexible storage. They are also typically more profitable for automakers. They tend to command higher prices than comparable sedans and compact cars since customers are willing to pay more for a vehicle they feel offers more capability. “This is really where every company needs to go, if they aren’t already there, and that is certainly true of Tesla,” said Karl Brauer, executive publisher at Cox Automotive, a firm that owns several vehicle sales and industry information businesses, such as Kelley Blue Book and Autotrader. While Tesla is widely regarded to have a strong brand and a lot of buzz around its vehicles, it mostly competes in segments that are losing market share to SUVs. It has just one SUV, the Model X, leaving it with two sedans, a shape that has fallen out of favor with U.S. car buyers. “He has a great sales number on the sales side for the Model 3 against other luxury sedans, but then you roll in similarly priced SUVs, and they are doing much better. Having a big chunk of the sedan market probably isn’t as beneficial as a smaller chunk of the SUV market,” Brauer said. This should also be Tesla’s easiest vehicle to produce, Brauer added. Selling an SUV or crossover often allows an automaker to repackage a significant chunk of the parts it uses for cars in a higher-priced package, allowing it to rake in more money while streamlining costs. The Model X was based in part on the Model S sedan, but Tesla ended up adding so many features to the X, such as falcon-wing doors, that made the SUV even more complicated to produce than the S.
In contrast, the Model Y will share about 75 percent of its parts with the Model 3, Musk said on the company’s fourth-quarter earnings call at the end of January. Musk had initially wanted to develop a separate platform for the Y but was talked out of it by other Tesla executives. “If [Elon Musk] doesn’t put crazy doors on the Model Y, and I am fairly certain that he won’t, then he will take away the one variable that hurt the Model X’s launch, and it will be a fairly smooth transition,” Brauer said. That said, Tesla faces a few challenges some investors say stand to cut into demand for its vehicle. A $7,500 federal tax credit for Tesla buyers was halved beginning Jan. 1 and there’s a crop of new competitors hitting the market over the next two years. “Our main concern is the electric vehicle tax credit. We think that is going to hurt demand for all their vehicles, throughout 2019 and at the end of the year as the credit completely goes away,” said CFRA analyst Garrett Nelson. Musk acknowledged the company’s cars “are still too expensive for most people” when the company announced on Jan. 18 plans to reduce its headcount by 7 percent. Lowering prices is key to the company’s goal of making electric cars widely available. In the U.S., Tesla remains primarily a car for Californians. Roughly 43 percent of its sales last year came from that state, partly due to the appeal of higher-end vehicles there and partly due to the popularity of fuel-saving cars, said Edmund’s analyst Jeremy Acevedo. Even the Model 3 failed to diversify or expand that audience much. The next two luxury brands most heavily concentrated in California were Porsche and BMW with just 24 percent each. “No other luxury automaker relies on California for more than a quarter of their sales,” Acevedo said. And make no mistake, Tesla is a luxury car maker, he said. Although Musk just unveiled a slimmed-down version of its Model 3 for $35,000, many buyers are still opting for the higher priced versions. Acevedo thinks the Model Y will likely sell for around $50,000 to $60,000. The other challenge Tesla faces is growing competition. While the crossover and SUV segments are pretty crowded, there are few electric utility vehicles on the market for now, Nelson said. Jaguar competes in the high-end of the market with the I-Pace crossover, and Audi is releasing the e-Tron SUV. At a lower price point, Hyundai has the Kona Electric, which shared the prestigious North American Utility of the Year award with the gas-powered Kona at the Detroit auto show in January. But even more electric SUVs and crossovers will hit the market in 2020, right around the time the Model Y is scheduled to roll out. Volvo’s Polestar brand will unveil the Polestar 2, a crossover-type vehicle that appears to be positioned to compete directly with the Model 3, and by extension, the Model Y.
Nissan also has plans to sell 1 million electric and hybrid vehicles a year worldwide by 2022, and German giant Volkswagen said Tuesday it plans to boost its electric vehicle sales to 22 million over the next decade, a 50 percent increase over its previous target of 15 million vehicles. Tesla appears to have a lead over competitors in a few areas, such as battery technology, Morningstar’s Whiston said. The hype around the company and its fiercely enthusiastic fans are also likely to generate a lot of initial interest in new products such as the Model Y.